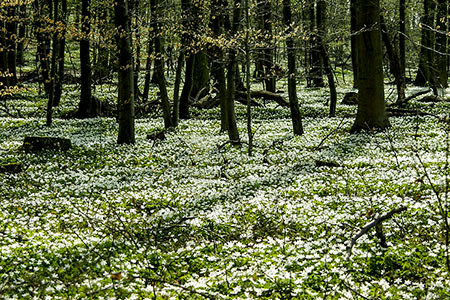 The Soonwald forest is part of the Hunsrück and is one of the largest forests in Germany. Its altitude (400-600m, the highest point the Ellerspring with 657m) makes it an ideal recreation area for people looking for quiet. 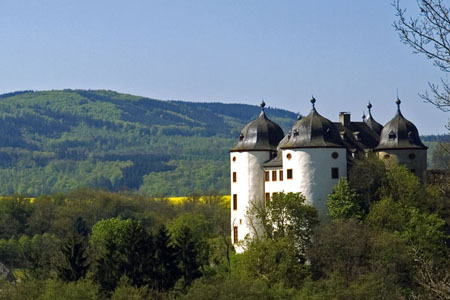 It is easily accessible with more than 800km of hiking paths. One can hike here for hours without meeting another human being. However the traces of two thousand years of human history are to be found everywhere. It is obviously rough and wild, but tender as a sunbeam upon spring green and tame as a stream bubbling over the rocks. Mountain meadows are to be found everywhere, especially meadows of oat grass, yellow oat grass, and bristle grass. These natural pastures have become sanctuaries for rare types of plants such as Arnica, finial, forest hyacinth, Mondraute, Crane's bill and Lady's mantle. In many places there are wetlands where many types of orchid have been preserved. Marsh clover, marsh cinquefoil (Potentilla palustris) und marsh lousewort are also at home here. In some of the swampy areas and marshlands the Round-leaved Sundew, the Swamp-lycopod and the especially rare royal fern, thrive. Practically all species of conifers native in the Hunsrück today (and considered typical for the Hunsrück) were actually only introduced in the past century through forestry. The only original conifers are the yew and the juniper, a shrub that needs a lot of light, but is otherwise fairly undemanding, which allows it grow well on the rocky and humus-poor soil of the slopes of the Nahe valley and the Hunsrück. There these frequently stunted, in various forms occurring shrubs build a very attractive juniper heath. The extensive forests provide exceptional protection for game. Roe deer, fallow deer, wild boar, rabbits and foxes as well as wild sheep and wildcats are at home here. A bird typical of the forest here is the black woodpecker. Tawny Owls and Horned Owls are common, Barn Owls and little owlets, less so. On the steep slopes of the streams, the kingfisher can be seen.